Today I couldn't convince Toby to change out of ancient, grubby looking, hand-me-down Thomas the Tank Engine pyjama top, so it seemed like a good day for doing something really messy. This activity is one for when you have enough time and patience to tackle a bit more of a clean up operation since, unless your small children are far better at following requests than mine, it does end up with slime covered clothes, floor and table. Not to try to put you off, because it is brilliant fun, but I also would keep this one well away from carpets. The basic kit is really cheap and easy to get hold of. You will need cornflour, water and something to colour it with - food dye if you have it, but I've used turmeric or fruit tea before and they work fine. The proportions are a cup of cornflour to half a cup of water, plus a few drops of dye. You may need to help with stirring as the ingredients can be a bit tough to mix. As they come together you should start to notice the shear-thickening properties of the slime - the faster you stir, the harder it is to move. Slow right down and the slime moves much easier. We are generally more familiar with Newtonian liquids where the viscosity of the liquid doesn't change with the pressure applied to it - you can stir that cup of tea as fast as you like, it won't get any harder to stir. Non-Newtonian liquids act differently, in this case the liquid has 'shear-thickening' properties. In other words, the more pressure you apply to it by stirring faster, the more viscous and difficult to stir it becomes. I have never met anyone who didn't embrace their inner child when faced with cornflour slime. It defies common sense in a really appealing way that encourages play and experimentation. 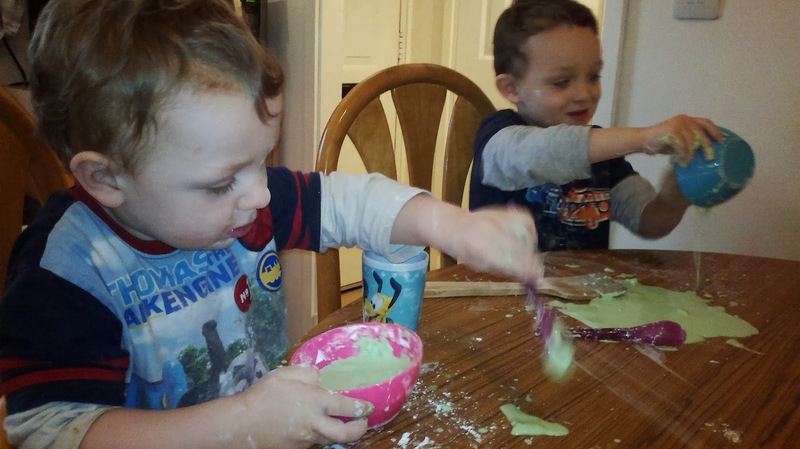 In the picture of my two boys together you can see them both experimenting with pouring the liquid from a bowl or spoon to make a puddle, yet if you push the puddle with a spatula you can heap it up. 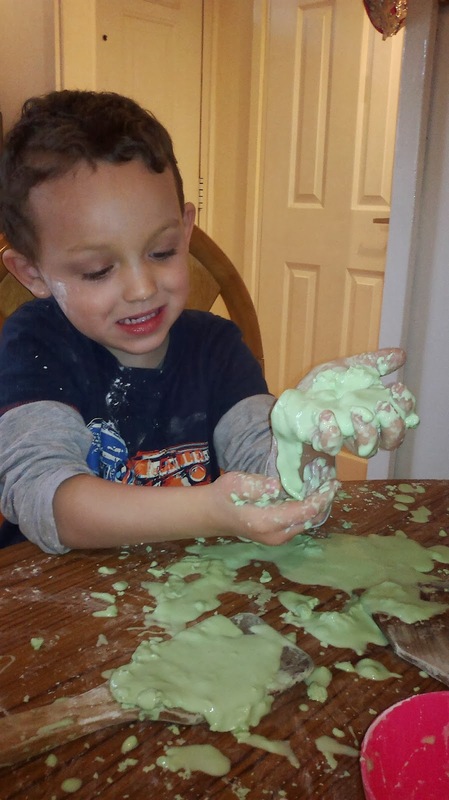 Grab a handful of the slime and so long as you keep squishing it and rolling it in your hand it stays a wobbly solid, but as soon as you stop moving it, the slime 'melts' and runs away slowly. It also has quite a nice chalky texture, so can be a good messy-hands activity for children who can't stand dirty hands. You can focus on talking about the way the texture changes and may wish to consider adding a scent such as a food flavouring to add to the sensory experience. 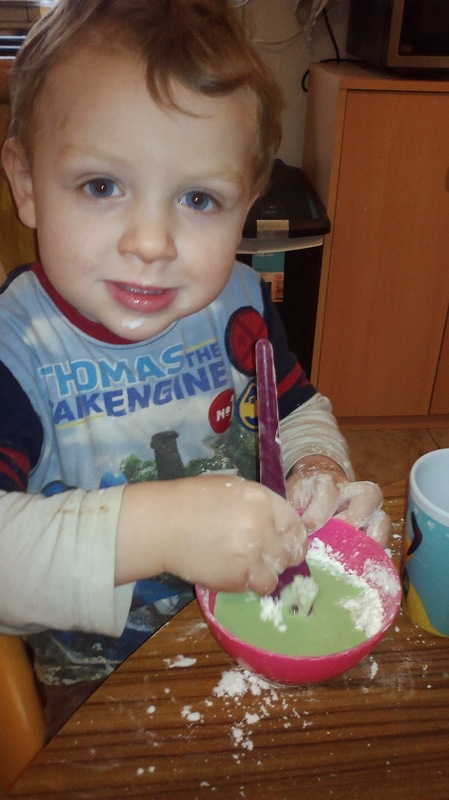 Little experimenters can find out what happens when they add more cornflour or more water to their mixture. Making predictions is a really valuable skill for science that you can easily incorporate into this. The question 'If you add more water do you think it will make the slime runnier or thicker?' seems very basic, but small children don't have your experience and probably won't know for sure. I'm obviously doing this activity with tiddlers, but if you have older children there's a whole world of fluid mechanics to explore with this simple mixture. You could also try finding out about other shear-thickening liquids such as quicksand or investigate their opposite numbers - shear-thinning liquids. There quite literally wouldn't be life as we know it without these, since blood is a shear-thinning liquid. This is a property of ketchup which explains why if you give it a good shake you can convince it to thin enough to come out of it's bottle. Toothpaste is another one - squeeze the tube and it becomes less viscous so it can come out, but then thick enough that it doesn't drop off your toothbrush. If you have no idea about the science, it's still good fun and a chance to develop your child's language skills by describing new experiences. If you do know the science, don't be afraid to use whatever level of language you know by mixing basic descriptive words with the more complex ones. By exposure to complex language kids can surprise you with what they pick up, even if they don't know straight away what it all means you are priming them to remember the terminology in the future. It's also fun to hear the words 'non-Newtonian liquid' from a four year old. Should your little scientist make the leap to ask 'why does it do that? ', you can nicely evade any really technical attempts at explanation with the phrase 'nobody really knows for sure, perhaps one day you will be the person to find it out'. Ollie wants to be a crane driver and Toby just says 'choo choo', 'snake' or 'chocolate cake' to most questions, so I'm pretty sure they're not considering a future in fluid mechanics just yet.